Elementary and secondary school administrators will appreciate this comprehensive, ready-to-use staff development activities program that integrates in-service training, supervision, and evaluation. The program encourages professional growth through self-assessment and includes over 120 reproducible forms, charts, models and other aids that can be used "as is" in developmental activities. Topics and activities include Professional Growth in Schools: Looking at the Big Picture, In-Service Training, What It is and What It Can Be, Extending Current Concepts of In-Service Training, Supervision: Past & Present, The What & How of Supervision, The Process of Effective Supervision, Teacher Evaluation: Past & Present, The Processes of Effective Evaluation, Assuring the Linkages Among In-Service Training, and Supervision, & Evaluation. Includes a reproducible four-page Observation Booklet designed to help teachers gather information about their classroom performance and to promote teacher self-reflection and self-evaluation. 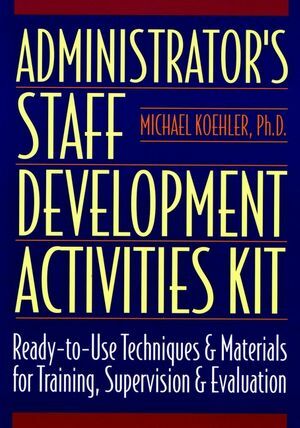 Michael D. Koehler, Ph.D., has been teaching educational administration, leadership, and supervision since 1974. The author of 14 educational resources by Prentice Hall and its imprints, he currently is teaching part-time as well as writing, speaking and consulting with schools on teacher supervision and other topics. SECTION 1: Professional growth in schools: looking at the big picture. Figure 1-1 professional growth model. The complementary relationships among in-service training, supervision, and assessment. What is currently happening in many schools? Figure 1-2 professional growth in many schools. Taking a closer look at processes. Taking one last look at the linkages. Taking a closer look at empowerment. What are the needs of teachers? Relating motivation to professional growth. Money as a external motivator. Consider the farmer and the seed. Professional growth as a motivator. The absence of total quality. Figure 1-5 needs assessment format. Introducing professional growth as "helping hands". Considering the context of professional growth. SECTION 2: In-service training: what it is and what it can be. In-service training: what should it be? Finding experts in the building. Figure 2-2 sharing your strengths. The move toward transpositional leadership. The current picture of in-service training. Reconsidering the value of new knowledge found outside the school. Figure 2-3 follow-up for university and workshop experiences. Figure 2-4 culture and climate: an inventory. Figure 2-5 values and student behavior: a needs assessment. SECTION 3: Extending current concepts of in-service training. When such experiences are not provided. Taking a closer look at the appearance of change. How to avoid "in-service draining". Looking at the nuts and bolts. Figure 3-1 introduction to in-service activities: new teachers. Figure 3-2 new-teacher in-service evaluation. Figure 3-3 new-teacher in-service year-end evaluation. Taking a closer look at the school's culture. Figure 3-4 it's your call: case study. Figure 3-5 it's your call: case study 2. Figure 3-6 it's your call: case study 3. Figure 3-7 it's your call: case study 4. Figure 3-8 it's your call: case study 5. New-teacher orientation and the instructional program. Figure 3-10 a quick suggestion. Intravisitation observation and follow-up meetings. Figure 3-11 visitation resource book. Conversations with experts in the building. Considering the value of portfolios for in-service training. Figure 3-13 portfolios: a few suggestions. Using journals to promote introspection. Relating in-service training to super vision. Figure 3-15 professional growth relationships: in-service to supervision. SECTION 4: Supervision: Past and Present. Supervision and the administrative hierarchy. The downside of teacher evaluation. Sharing performance standards with teachers. Figure 4-1 standards of teacher performance. Distinguishing among administratively directed, peer-directed, and self-directed observation. Encouraging teachers to take risks. The need for philosophical consistency. SECTION 5: The what and how of supervision. Our need to risk imperfection. Relating the standards to in-service information. Relating the standards to supervision and evaluation. Collecting and using observational data. Figure 5-3 classroom observation: preliminary input. Figure 5-6 the johari window. Projecting the experience to future lessons. Promoting proper behaviors among all supervisors. Figure 5-8 role-playing episode 1. Figure 5-9 role-playing episode 2. Figure 5-10 role-playing episode 3. Figure 5-11 evolution of leadership. SECTION 6: The process of effective supervision. Assessing the need for change. The availability of in-service training. Figure 6-1 a quick in-service: standards: 1-4,1-5,1-6,1-7,1-17,1-25. Figure 6-2 a quick in-service: standards: 1-11,1-14,1-17,2-4. Taking another look at self-directed observation. The advantages and principles of self-directed observation. Maslow's continuum: from potential to perfection. Figure 6-4 maslow's hierarchy of needs. Figure 6-5 the actualization continuum. Figure 6-8 an audio experience: introduction. Figure 6-9 an audio experience: reflections from the mirror. Figure 6-10 an audio experience: follow-up. Figure 6-11 a video experience: introduction. Figure 6-12 a video experience: pretest. Figure 6-13 a video experience: pretest thought. Figure 6-14 a mirror of performance: general self-evaluation. Figure 6-15 a mirror of performance: a few specific considerations. Figure 6-16 a mirror of performance: specific teaching behaviors. Figure 6-17 a mirror of performance: follow-up thoughts. Figure 6-18 video observation request for camera operator. Supervising supervisors, administrators, and others. Figure 6-22 Mundelein high school: superindentent performance feedback survey. Figure 6-23 developing observation instruments. Figure 6-24 professional growth relationships: supervision to evaluation. SECTION 7: Teacher evaluation: Past and Present. Reconciling reality with traditional expectations. Evaluation and the school hierarchy. The need for quality control. Figure 7-1 one way to create an observational record. Figure 7-2 a better way. Figure 7-3 the "better way" can lead to the best evaluation. Figure 7-4 the year in review. Figure 7-6 feedback: teacher-directed observation. Evaluation for what? From quality control to dismissal. Taking another look at behavior. Figure 7-7 role-playing episode: teacher evaluation. SECTION 8: The processes of effective evaluation. Efficiency versus effectiveness: taking another look at checklists. Maintaining teacher self-evaluation during the summative process. Using the observation instruments in an evaluative setting. Integrating supervision with evaluation: an example. Figure 8-3 interviewing for tenure: sample questions. Evaluating for dismissal (someone has to do it). The realities of due process. Procedural and substantive due process. Clarifying the grounds for dismissal. Relating evaluation to in-service training. Figure 8-7 professional growth relationships: evaluation to in-service. Figure 8-8 it's your call! (1). Figure 8-9 it's your call! (2). Figure 8-10 it's your call! (3). SECTION 9: Assuring the linkages among in-service training, supervision, and evaluation. Developing an effective professional growth program. Taking another look at the helping hands. The reality of transpositional leadership. Figure 9-1 the continuing evolution of educational leadership. Maintaining the focus on the school's values. Emphasizing a common belief system. Considering the impact of collective bargaining. The basic purposes of professional growth: a review. A quick in-service: criteria for student success. A quick in-service: the previous learnings. A quick in-service: elements of curriculum. A quick in-service: housekeeping chores. A quick in-service: using praise. A quick in-service: questioning technique. A quick in-service: lesson objectives. A quick in-service: active listening. Probe and elaboration question tally. Teacher movement in classroom tally. Teacher movement in classroom tally example. Guided and independent practice tally. Managing variable levels of ability. Teaching different levels of ability tally 1. Teaching different levels of ability tally 2.